For over 28 years, Volga-Dnepr Group has been advancing the world of air logistics, enabling our global customers to achieve fast, secure and cost-efficient transportation solutions, even for the most complex logistics challenges. Our international reputation has been built on helping our customers to plan effectively, respond quickly and, most importantly of all, keep the promise they have made to their own customers. That’s why so many of the world’s leading companies choose Volga-Dnepr Group as their transportation and logistics partner. The dimensions you provided exceed the base parameters and will need to be reviewed by our engineers. Please use the form below to leave your details and we will get back to you shortly. Act now to avoid delays! We aim to respond within 15 minutes of you query. Get practical information, AOG updates and workshop schedules to your mail box. The cargoes we move help our freight forwarder and aerospace partners to find fast, trackable, and managed solutions to deal with AOG (aircraft on ground) situations. We deliver engines, spare parts, brakes & wheels, aircraft components and other supplies, which are essential for putting an aircraft back to service and preventing further delays or cancellations. Volga-Dnepr Group’s highly-educated and skilled workforce has a proven track record of tackling every aspect of the transportation and logistics process, no matter how complex or extreme the challenge may seem. Airlines all over the world focus on improving the reliability of their services through expansion of their fleets, route networks and optimization of their aircraft and engines. That is why it is important to have a peace of mind of knowing that pre-emptive solutions are in place to handle AOG situations and to ensure minimal impact to their routine operations. 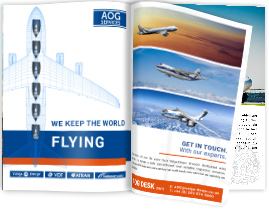 Our AOG service has been designed by the airline industry experts to deliver this assurance. Volga-Dnepr AOG team includes specialists from Volga-Dnepr Technic - dedicated provider of MRO services to various types of aircraft. The AOG team guarantees prompt response and actions to AOG situations at any location worldwide, including provision of highly qualified personnel on site to perform aircraft inspection and assessment scopes, ordering and replacing required parts and components, and processing relevant records. Supported by a 24/7 team of aviation professionals and logistics practitioners, our dedicated AOG service offers the fastest and most cost-efficient solutions. Group’s unique Boeing 747, Boeing 737, An-124-100 and Il-76TD-90VD fleet enables smooth and seamless air charter and scheduled cargo services. AOG spares carried with the Group’s scheduled services in Europe, North America and Asia Pacific are confirmed on the first available flight. Our AOG service has extensive network of international MRO stations in various regions of the world with dedicated hangar facilities in Leipzig (Germany) and Sharjah (UAE). All MRO stations are properly equipped and powered by high-end MRO specialists. In case of AOG we take prompt actions in forming AOG team with field trips organized shortly after request. Delays will significantly increase the costs. Contact us now. Volga-Dnepr Technics has implemented a system of prompt AOG response actions, with forming an AOG Team consisting of omni-purpose specialists able to eliminate defects within the shortest period. Our 24/7 AOG Desk is staffed by aviation and logistics experts, providing our customers with a seamless around the clock service. International coverage with local offices and personnel in every region of the world and favorable locations of MRO bases in the UAE, Germany, Belgium, and Russia. With visibility across the entire fleet, our AOG Team can provide you with quickest and most economical solution to even the most complex AOG requirement, offering comprehensive pricing solutions within minutes. of Volga-Dnepr Group, containing both ramp (An-124-100 and IL-76TD-90VD) and non-ramp (Boeing 747 and B737) freighters. Our AOG solutions combine all of the best practices and experience of Volga-Dnepr Group’s global team, developed over more than 28 years of serving customers worldwide. The team with a proven history of managing AOG transportations through long-term customer relationships established over more than 28 years of operations. Certified, experienced, and highly-skilled specialists, including engineers and technicians, who understand your requirements and are ready to provide a proactive response. Packaging advice and support for your AOG shipment to ensure the integrity, safety and security of the aircraft spare part throughout the transportation process. Sharjah. Our 22,000sqm MRO hangar in Sharjah is capable of accommodating six narrow body (737/A320 size) and two wide body (747 size) aircraft simultaneously. It is complemented with all required special docking, tools/ equipment and utilities appropriate for efficient and quality maintenance of various types of aircraft/engine combination. The hangar is fully air-conditioned and have a high quality fire detection and protection system. Leipzig. Our MRO Base in Leipzig is a 8,500 sqm facility equipped with all necessary tools and equipment, wheel and brake shop, structure repair shop as well as heated floors to perform safety maintenance services for the various. It can accommodate one B747 type wide-body aircraft or up to four B737/A320 narrow-body aircraft in parallel. Operational bases across the globe to provide faster and more cost-efficient access to its fleet and services. From small aviation components to wings and entire aircraft, Volga-Dnepr has established itself as a vital partner in the aerospace logistics supply chain for world leading companies. Who organizes the flight permits? Our Flight Operations Team arranges all necessary overflight and landing permits. We have an AOG aircraft on a route not in your scheduled freighter network, can you assist? Yes, of course. We operate both charter and scheduled flights and, depending on the size of your component(s), we will either divert a scheduled aircraft or arrange a charter to your destination. Do you offer a Cargo attended service? On all our freight flights, your consignment is accompanied by a highly experienced team of loadmasters, engineers & flight crew. All shipments are tracked and handled by our 24/7 operations team, ensuring you have full visibility and control of your shipments. Can Volga-Dnepr deliver oversized loads? We operate the world’s largest fleet of Antinov-124s, an aircraft with the largest freight capacity of any now flying. In addition, we have over 28 years of unrivalled experience handling oversize and complex consignments for the aerospace industry. Can you respond out of office hours? Our Operations Team is on call and available 24/7, 365 days a year.